Within Kent County, Michigan, lies Grand Rapids — the nearest city to my hometown of Byron Center, and my prior residence for four years before moving to Chicago, Illinois. Like Chicago, there are many smaller suburbs within the outskirts of Grand Rapids, many of which I have spent time in, unaware that the land I was driving past was a landfill in the 50’s, or that toxic waste, such as arsenic, was disposed of in the 60’s at a building I might have walked past. It’s easy for us to live in a bubble, where the impacts of waste and pollution don’t affect us; however, we all have been impacted by landfills in some way, although we may not have been made aware of it. Taking even a perfunctory look into Superfund sites and other former landfills is a great reminder that this problem is everywhere, and not just someplace far away in some other neighborhood — as in an attention grabbing crisis such as Love Canal — but in small communities across the country. 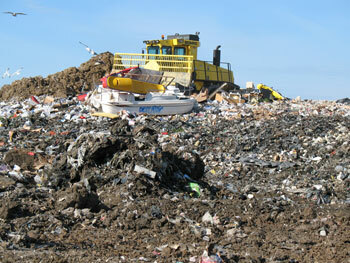 As with any county in most states, the need for landfills and disposal sites only grew as the communities grew. The larger and more affluent they became, the more spread out and diverse the locations needed to be. Before the eventual realization that strict guidelines and boundaries needed to be put into place, many operations could make their own procedures in regards to waste, and dispose of things however they pleased. Kent County in particular, holds one of Michigan’s largest cities, Grand Rapids, and is also surrounded by farmland, which gives ample land for disposal sites. Due to the demographics and average income combined with a predominantly white population, it’s not a surprise that the majority of Superfund sites in Kent County have been deleted from the National Priorities List since the 1990s, implying that they were among the first to see an improvement. This pattern of predominately white middle-class neighborhoods seeing laborious activity towards recovering these lost sections of land, only for the effort to fade out before reaching more poverty stricken or ethnically diverse neighborhoods, perpetuates the idea of Environmental Racism. Read the entire text of Danielle Maurer’s article, “A Toxic Mitten,” here in pdf or Word format.